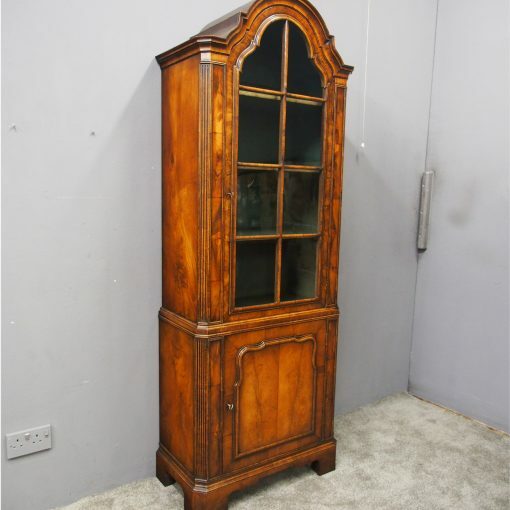 Circa 1900, George I style neat-sized figured-walnut, two-part bookcase. The arched top has a deeply moulded cornice over a cross banded astragal glazed door, opening to an interior with a blue/green ‘distressed’ finish. The sides have beaded pilasters which are flanked by fluted canted corners and figured gables, with the lower section featuring a panelled door. This opens to a shelved interior and it all stands on a moulded base and shaped bracket feet. Size 190 cm high x 70 cm wide x 30 cm deep.